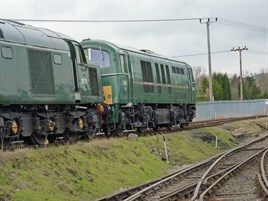 The National Railway Museum’s Class 71 (E5001) will be repainted in time for next year’s ‘Rarities’ gala at Barrow Hill in April. The suggestions are it will be in BR blue, but the NRM says discussions are ongoing. Currently based at the Derbyshire roundhouse, the ‘71’ will lose its current green livery in favour of blue. The repaint is being funded by Barrow Hill Engine Shed Society, British Railway Modelling magazine, DJ Models and Kernow Model Rail Centre. If it is painted blue, then this will be the first time a ‘71’ has carried this livery since 1977. The locomotive is the only surviving member of the 27-strong class. For more information, see RAIL 763, published December 10. It was not repainted. Very disappointed when I visited Barrow Hill to see the 71 looking very tatty.